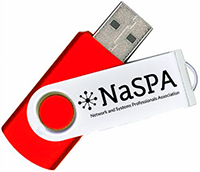 Full Voting Members are the only NaSPA Members who can start a NaSPA chapter, or serve in an official capacity for either NaSPA at large or a NaSPA chapter. Additional recognition of your support in the form of a handsome certificate. A “yourname"@naspa.online email address for you and up to five (5) family members. There are lots of reasons to become a full member but the biggest one may be your commitment to the Information Technology industry and willingness to be proactive in its success. Please consider this tier. Full Voting Membership: $96.00 / Yr.
That's only $8.00 per month, and you can safely join in less than 3 minutes below. For a limited time, a FREE thumb drive comes with your new membership! It will be shipped as soon as possible.